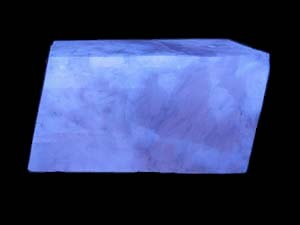 Some minerals will fluoresce a different color in response to different ultraviolet wavelengths. The four images above of calcite from Challenger Cave, Neuveo Leon, Mexico, show it's blue short-wave (SW), cream medium-wave (MW) and pink long-wave (LW) ultraviolet response. The last image shows it's white color in normal light.